It had been an early morning rush, first on the flight from England and then on the train from the airport to the heart of Amsterdam for my rendezvous with Steeler’s Explorer 50. Feeling a bit frazzled, I turned the corner onto the quay to see this trawler yacht sliding into the canal berth to pick me up. The sight made my hectic morning travels worth it. Approaching the berth was one of the most beautiful yachts I have seen. And apparently I am not the only one to notice: Steeler Yachts won European Powerboat of the Year in both 2015 and 2016, and they were nominated again in 2017. The Explorer 50 is a no-compromise vessel, reminiscent of the traditional fishing boats that were built from wood 60 years ago. 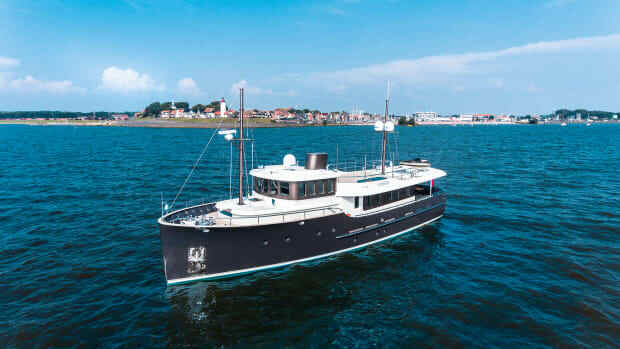 Just as with those vintage trawler designs, the first feature to draw your attention here is the vertical stem standing out proud from the bow. This sets the pattern for the rest of the hull, and the Explorer’s heavy-duty fender strip follows a conventional sheer line. On this pilothouse version of the Explorer 50, the balance of the superstructure is close to perfect. But if bridge clearances are a concern, Steeler also offers a sedan option. The boat’s clean wake indicates an efficient shape below the waterline. 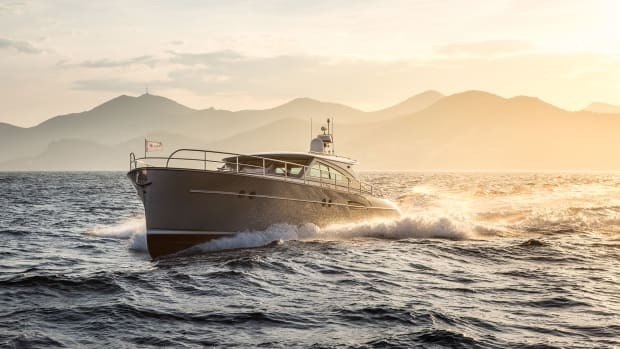 Most boats in the extensive Steeler range, including its S-line and Next Generation models, are stylish designs that more closely resemble modern takes on Downeast cruisers rather than traditional trawlers. 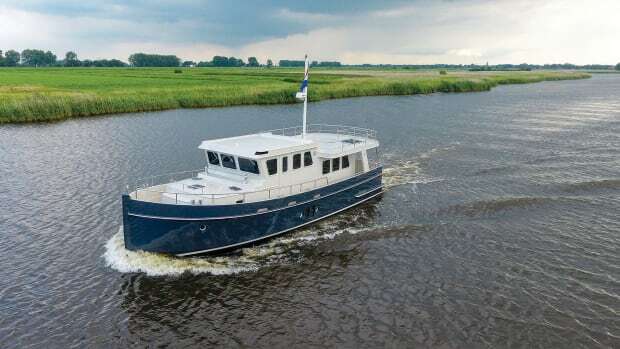 Though Steeler’s other lines make heavy use of both aluminium and steel construction, the Explorer honors the past, employing a traditional all-steel build and handsome, if a bit boxy, lines. 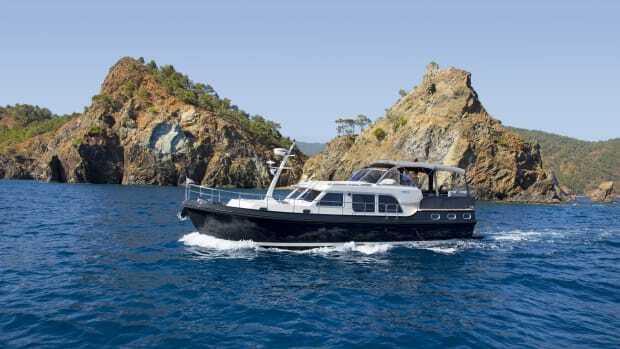 The Explorer is fitted out to today’s standards for high-end propulsion, control, comfort, and engineering. The Explorer 50 weighs in at more than 35 tons. The hull and superstructure are built up from nearly 2,500 pieces of steel, all carefully welded together. This allows for a multi-chine hull that mirrors the rounded bilge shape of traditional working boats. Her pronounced, exposed stem continues along the hull’s bottom as a keel before merging into a skeg, which protects the propellers. Although the boat’s hull looks traditional, it is finished with a modern painting process. Shot-blasted prior to priming, the hull is faired, then painted again before another round of fairing turns the plating true. Only then are final coats of finish paint applied. In order to ensure the highest quality (and to reassure the client), an independent paint surveyor comes in unannounced to make periodic checks on the painting processes and issues a quality certificate upon completion. The galley comprises a large stone worktop with the hob and sink inset. There was the usual fridge/freezer, dishwasher, and oven/grill installed on the model I tested, but everything within reason can be customized. A simple, but warm, saloon coddles the owners and welcomes visitors. Stairs down from the pilothouse lead to the saloon, which has been kept simple and functional. A large L-shape settee surrounds a table that can expand to accommodate dining. The cockpit—large enough to be comfortable—provides access to a sundeck via a fairly steep ladder. The after end of the sundeck can be used to stow a tender; with launch and recovery by means of a mast-mounted derrick. 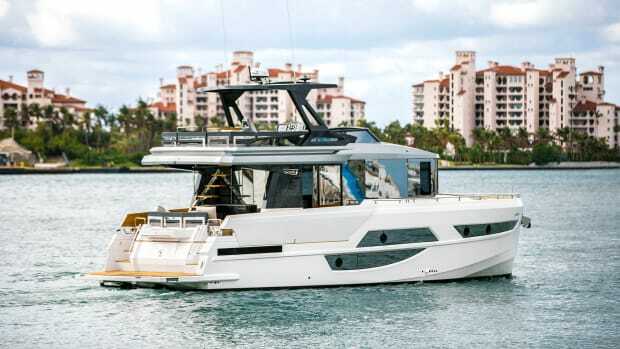 Or you could convert the sundeck into a full flybridge instead. 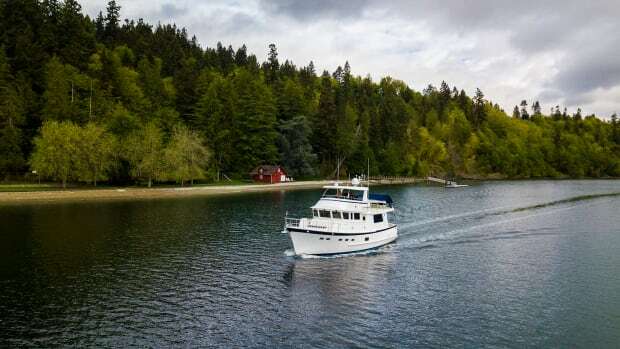 There are many opportunities for owners to customize each boat’s layout. Forward of the helm, stairs lead down to a small foyer where there are lockers housing a second fridge/freezer and a washing/drying machine. A few steps farther down, a door aft leads to the master cabin. Turn right at the bottom and there is the guest cabin. The master has hull-side windows and the large berth is set at an angle across the space. The en suite head has stone countertops. 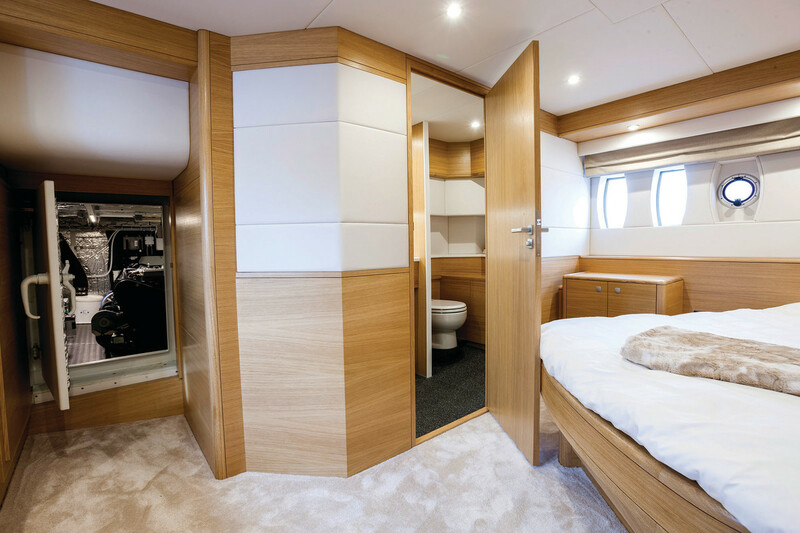 There are twin V-berths in the forward guest cabin and here the bathroom also serves as the day head with access from the foyer. 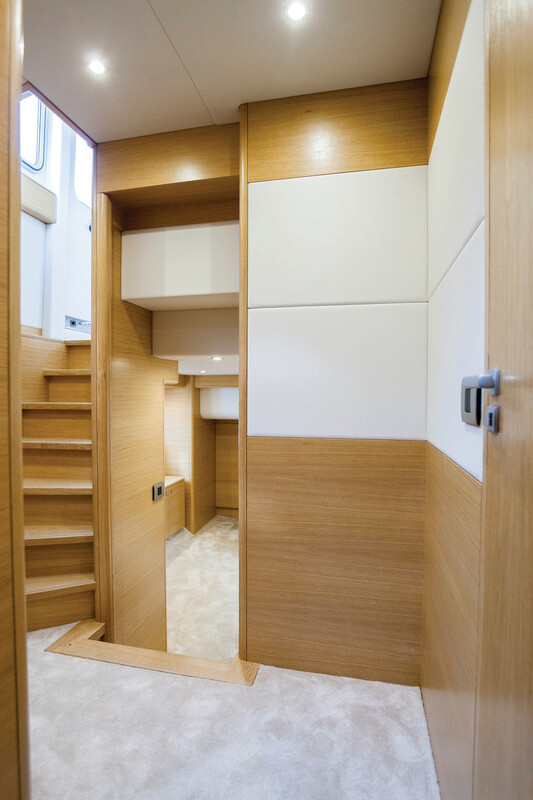 Easy access to the engine room from the master cabin. There are other configuration options, however, and a third cabin can be ordered in lieu of the extra fridge and washing area. The engine room is tidy and well arranged. 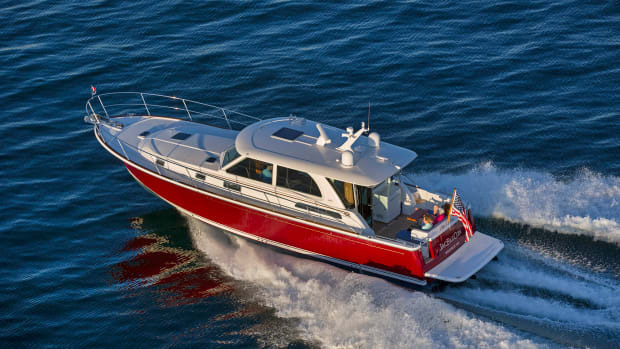 A pair of Vetus Deutz diesels powered the test boat, each one producing 170 horsepower. 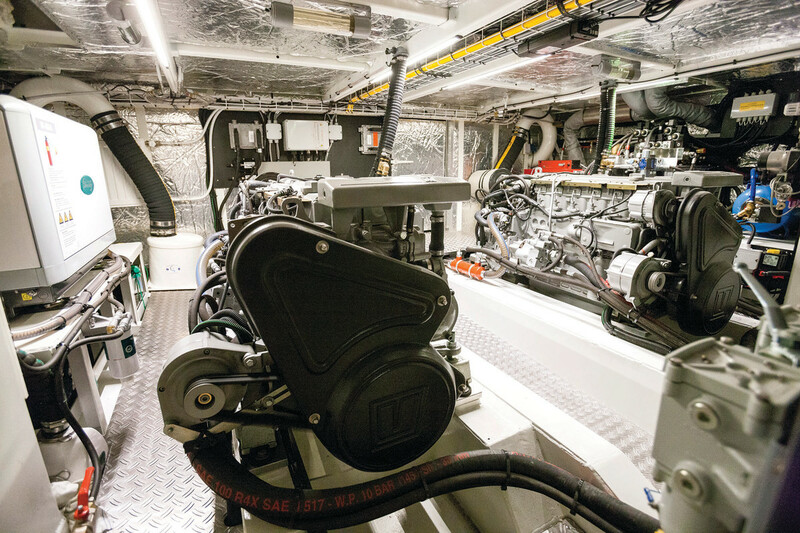 The engine room is located under the saloon, and there you will also find the comprehensive hydraulic system that powers the bow and stern thrusters and the mast-lowering system. The engine compartment is well laid out with easy access from the lazarette or via a double-door entry at the after end of the master cabin. It is a tidy layout designed for reliability, and while Vetus Deutz diesels are favored in the Netherlands, Steeler offers a wide variety of powerplants, including more popular engines in the States, such as Caterpillar and Cummins, with power up to twin 270 horsepower. 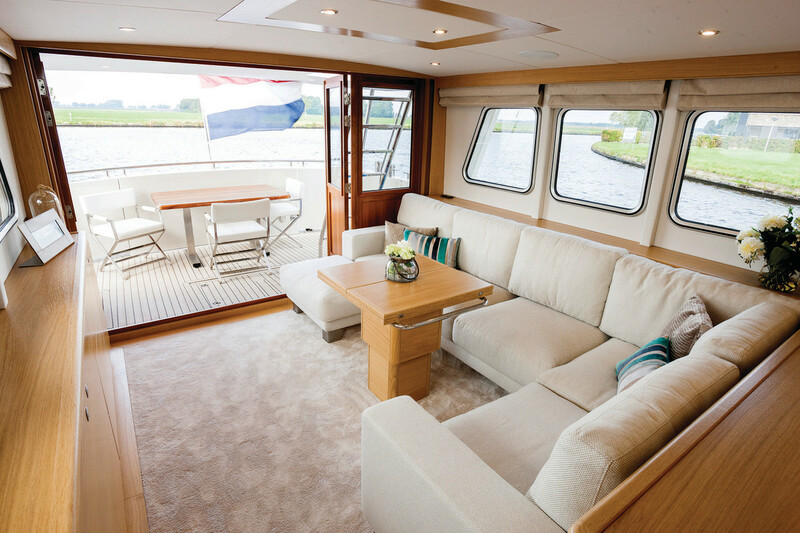 The lazarette can be accessed from the afterdeck and provides useful stowage space. However, the steering gear components are exposed and loose gear could get entangled with any number of moving parts. Steeler assured me that there will be a protective screen erected around the steering mechanics, but I would also like to see some fastening points in the deck for any loose items. The Explorer that I tested was fully functional but still waiting for the final interior fit-out. So the pilothouse was basic, all the essentials for navigation and control installed but no bells and whistles. The panoramic dash had a large Raymarine display flanked by smaller controls such as the autopilot. The bow and stern thruster controls were on one side and the engine controls on the other. The dash was kept simple and most other switches were hidden from sight under a flap beneath the dash. Steeler has switched to digital control for most of the systems, which are handled via a touchscreen display. The main electrical switchboard and backup controls were in a locker under the dash. A handheld controller allows you to remotely control engines, thrusters, and steering from anywhere aboard. This is great for single-handed operation. 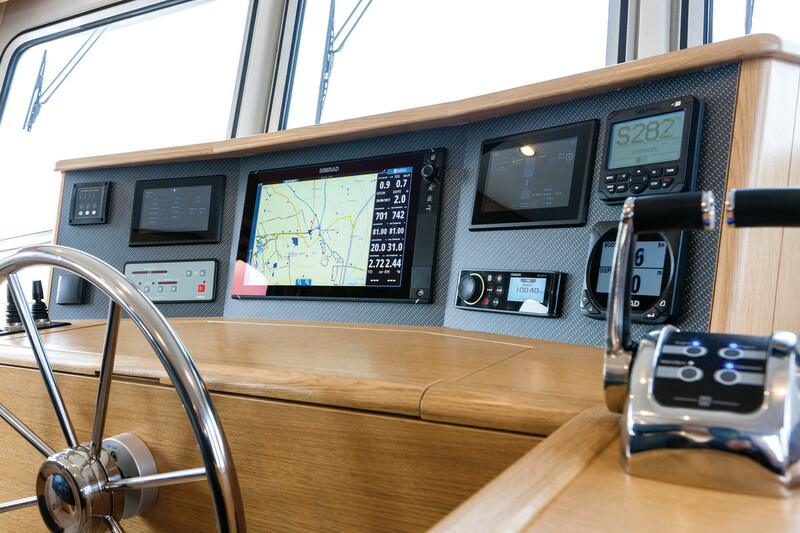 Sightlines from the pilothouse are excellent with the exception of a view astern as you have to duck down to see under the galley’s cabinets. A Simrad display is flanked by small controls. On the sea trial we headed out across the Zuiderzee, a large inland sea. Despite the fresh breeze only a little sea had built up and conditions were uninteresting. Steeler says they have tested the Explorer 50 in 10-footers in the North Sea where the boat’s stabilizers lent a smooth and solid ride. The Explorer 50 represents the more traditional side of Steeler’s offerings. The yard also builds in aluminium and offers an extensive range of designs with more than 20 different concepts and options, all of which have been built. Many of these designs are based on semidisplacement hulls and have been tailored to yachting in warmer climates. But the one that caught my eye when I visited was a wonderful new 65-foot build that was just reaching the fitting-out stage. Custom designed for an owner whose child uses a wheelchair, the vessel had been reconfigured for easy wheelchair access, among other special arrangements. This demonstrates the level to which Steeler will go to accommodate its customer’s needs. The Explorer 50’s wonderful curves introduced into the rounded transom are a joy to behold and demonstrate the yard’s mastery of steel work. The flared bow is also a delight and should offer a dry ride even in adverse conditions. On the drawing board is a Trawler 50, which is one of the most seaworthy-looking trawlers I have seen. 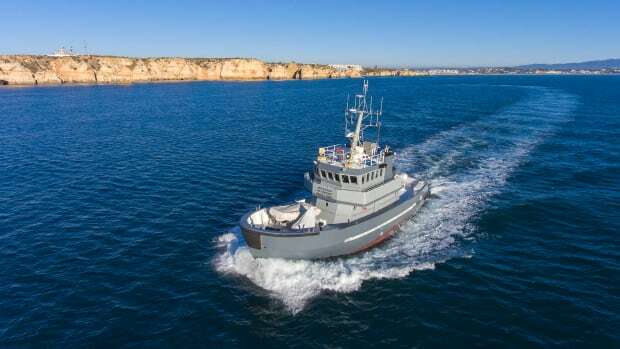 Another approach to trawler yacht design is seen in the Offroad 60, which is like an offshore support vessel with its pilothouse set far forward. 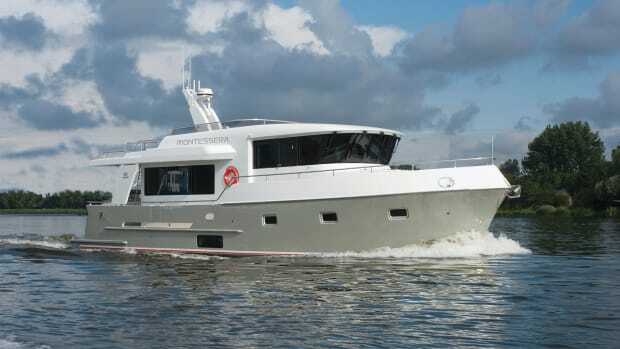 Steeler is set to deliver their first yacht to North America, which will come to Seattle in 2018. 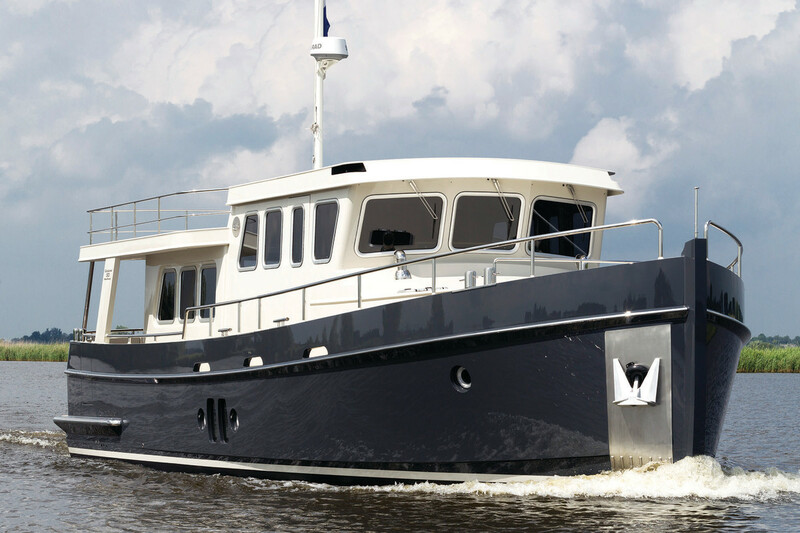 With the company’s wide variety of powerful designs, its steel yachts should be appealing to the U.S. trawler market. These hulls are great for those serious owners who want to explore parts unknown. Not only is steel capable of matching composites in its versatility, but it can offer an equally long life. As Steeler has shown, you don’t have to sacrifice style when you build in steel.